Dermalogica Professional Shave - I love a freshly shaven man who's skin is smooth like a baby's behind! Oh wait, there is an exception to my love affair. It's called RAZOR BURN!!!! It looks unsightly and feels painful. Well, I'm here to tell you that there is hope for all you men with sensitive skin! 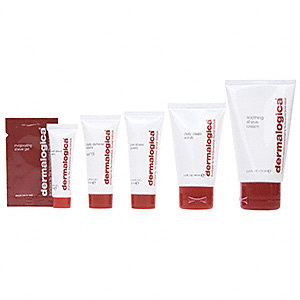 The Dermalogica Shaving line is a complete skin care system for those who want a close excellent shave. Used properly, these products protect the skin during a shave and have a fantastic outcome. Dermalogica made sure it was free from artificial colorants and fragrances as to not irritate the skin. The kit includes a Daily Clean Scrub, Pre-Shave Guard, Soothing Shave Cream 1.25 oz, Post Shave Balm, and a Daily Defense Block SPF15. Is suitable for all skin types. Watch the excellent Youtube videos below for complete instruction. "I am absolutely hooked. This is the first time in m life that I can shave everyday." "Finally no more ingrown hairs." "The post shave balm is my favorite. It has a cooling sensation and it prevents razor burn." "My girlfriend loves the smell." Do you love this skin product? Or could you have lived without it? Would you buy it again? Inquiring skin care minds want to hear from you!